Even the most carefully stored videotaped footage degrades with time. Programs archived on videotape should be digitized (converted) to a digital master file for long-term storage. A Cut Above has multiple video tape formats for video conversions to digital files. To ensure that the full quality of the master tape is preserved all digital video decks are interfaced via an uncompressed SDI connection or through FireWire retaining the original CODEC's quality for all re-mastered programs. After your footage is converted to a digital file we can re-master the video and audio including color correction and image restoration; audio can be enhanced to minimize noise, correct audio levels and better equalize the program. 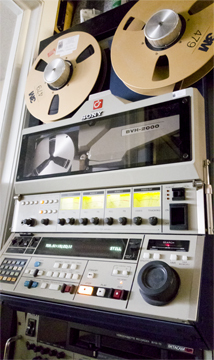 The result can be a re-mastered digital file of improved audio and video quality compared to the original master tape. A Cut Above digitizes video exclusively using broadcast video decks: Sony BVH-2000 one inch Type C, Sony BVU-950 3/4 inch Umatic SP, Sony DVW-500A Digital Betacam (with Betacam SP and Betacam playback), Sony DSR-1500A DVCAM, Panasonic AJ-HD1400 DVCPRO HD (with DVCPRO 50 and DVCPRO playback). Audio playback is available from Digital Audio Tape (DAT). A Cut Above has been in the broadcast video business since 1988 and has maintained all of its critical videotape playback capabilities; we have the experience, skills and equipment to produce the best quality digital master file transferred from your videotape archives.